In the pre-assessment 32 students participated in the assessment. The assessment covered 20 multiple questions. The class average points received were eleven out of twenty which is 55 percent completion. In the summative assessment of this two-week unit where the students presented in front of class to be evaluated in their proficiency in the presentational mode. The students were evaluated on a rubric with a scale from one to eight. One being the lowest, and and eight being the highest. Twenty-eight students participated in the presentation. Out of the 28 students, 8 received a score between 3-4 (28%), 9 received a score between 5-6 (32%), and 11 received between 7-8 (39%). Not one student who participated received a score between 1-2 (not met standard). Comparing the data there was overall student progress, students were not only able to identify the new words, but apply them in real context. In the student survey students were asked about their experience using the technology and what other activities were helpful learning the content of the two-week unit. 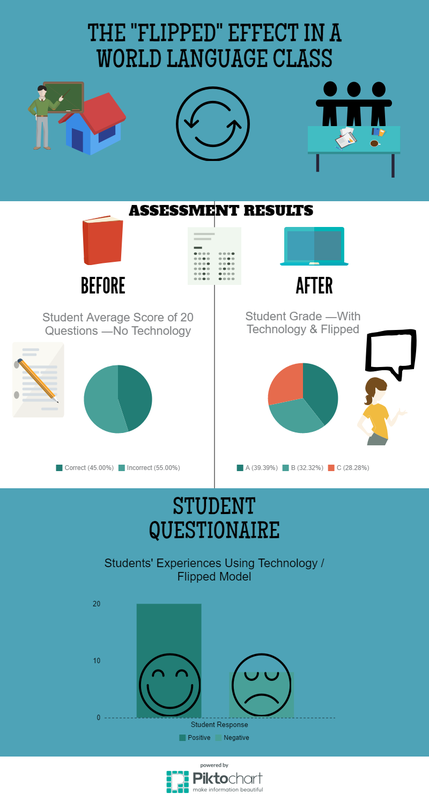 Twenty-eight students participated in the survey. The results demonstrated positive experiences throughout the unit. For example, students were asked were there any tasks that they disliked or were too rigorous, one student stated “No, because I have been with a partner for the past week.” Another question students were asked was “What other activities did you like about that class in the last two weeks?” Students stated that working with a partner on the presentation and sitting on the floor and learning about the house with the instructor. Other students stated that finding the houses online from Mexico. Even some students stated that it was too hard to choose. On the technological side students were more happy with the use of Quizlet because it made it easy and fun learning the vocabulary and that it was easy to access at home. ﻿Assessing is very important; and how you do it is also important. However, you can have a great assessment tool, but the feedback you provided may be too late or an adequate. We need to be precise where students need support, and with using rubrics, especially when comes to the modes of communication, students can reflect and improve by concentrating on the areas they need to grow. In addition to informative assessments; checking for understanding, it is also crucial to conduct an initial assessment before beginning a unit or final product. This is common practice, but sometimes overlooked, because we are pressured with pacing guides or time in general. Nonetheless, it will save you time, and will help differentiate for students who already know the content. Also, it will help accelerate your levels of instruction from identifying to application if students are familiar with the content. It can be simple as creating a google form with questions identifying parts of the house. I recommend this strategy for all language teachers. Click on the button for an example. As part of the language learning experience, the most important skill learning a language is communication. Especially with the emphasis of 21st century skills and learning for world languages, communication has become the central focus. Here are communication rubrics by the the American Council on the Teaching of Foreign Languages that assess the three modes of communication: interpersonal, interpretive, and presentational. In addition, you will find a presentation rubric in Spanish that was designed by the Napa Valley Unified School District that can be useful for preparing students communication and presentation skills. I believe as part of 21st century teaching and learning, I think it is important for students to reflect on their learning experiences and what they have learned. Here are some examples how you can make their learning meaningful, and at the same time, provide feedback to the instructor so you can improve and reflect on your instruction as well. With technology implementation, I would like to adapt this model into a digital form. For instance, a questionnaire using google forms, or even creating students podcasts to track their learning experiences. This can be a great way to make student reflection interactive.